It is easy to see that the second word is an anagram of the first word plus the first single letter. Similarly, the third word is an anagram of the second word plus the second single letter. When a number of such lines are collected together into a puzzle, the single letters combine to form two vertical Anchor words which are normally related by a common theme. 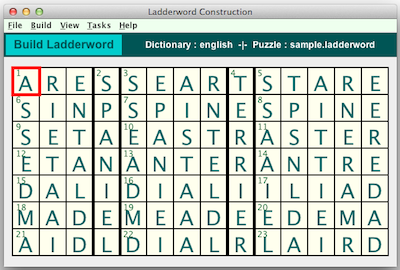 The following graphics show a LADDERWORD puzzle in the Crossword Express Build screen and a PNG graphic file produced by the program's print function, showing the complete puzzle. 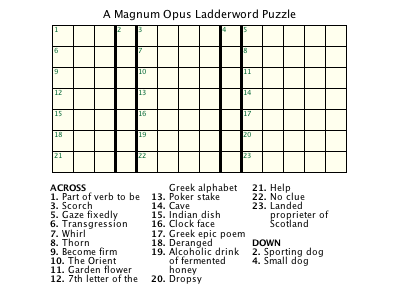 See also a full size version of a PDF file showing the complete puzzle. A Suggest function allows you to create puzzles manually, or to make changes to a puzzle which has been built automatically. The Edit a Clue functions permits clues to be edited or inserted into the puzzle. Puzzles can be printed in an unprecedented range of user controlled colors and formats. Output can be sent direct to the printer or, if you install the appropriate software, it can be sent to a PDF file. The recommended software for this purpose is Primo PDF which you can download free from their website, although you might consider sending them a small donation if you find their program useful. Mac users will be able to create a PDF file directly from the screen provided by the printer driver.